Capital Industries, Inc. has been in business since 1953, owned and operated by three generations of the Taylor family, and over six decades has distinguished itself as a world class manufacturing company. 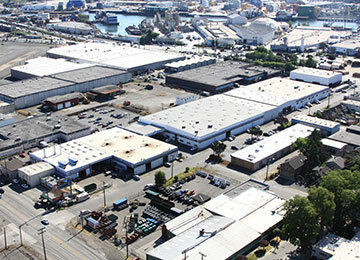 We are located in the Georgetown area of industrial Seattle and occupy a 4.5 acre site with 145,000 square feet under roof. We employ approximately 100 team members. Our broad base of equipment, plus the knowledge and expertise of our personnel has enabled us to support several industries: heavy truck, food processing, marine, oil and gas, solid waste, construction equipment and aerospace tooling to name a few. Capital is a supplier to several major international companies. What makes Capital Industries unique from most other metal fabricators is the breadth of industries we serve and the metals we process – carbon steel, alloy metals, aluminum and stainless steel; shapes and flat; metal thicknesses ranging from 16 gauge sheet through 3” plate. From the beginning, it has been our philosophy to maintain the most contemporary metal fabrication equipment, and keep our personnel in the forefront of the latest processes and technologies. Even a catastrophic fire in 2004 that consumed our offices and main fabricating facility could not deter us from our passion to succeed. Capital rose from the ashes more determined, better equipped and more efficient than ever before. Capital was registered by BSI in 1997 to operate a Quality Management System for the fabrication of ferrous and non-ferrous metal products to comply with ISO standards. In 2014, that registration was upgraded to the requirements of ISO 9001:2008. Our goal is to offer broad capabilities, competitive pricing, exceptional quality and outstanding service to each and every customer. This philosophy has kept Capital successfully operating throughout our history and we intend to build on our solid reputation and accomplishments for years to come.